Word is out that Seattle has the highest property crime rate in the nation, but not by the reckoning of our FYI Guy. Here's his take. Word is out that Seattle has the highest property crime rate in the nation, according to the latest FBI data. The news originates from the campaign website of Scott Lindsay, former Mayor Ed Murray’s public-safety adviser, who is challenging City Attorney Pete Holmes in the Nov. 7 election. The headline of Lindsay’s post screamed that Seattle has the highest property crime rate in the nation. Reading further down, Lindsay specifies that Seattle ranks No. 1 among “major” U.S. cities. Local media picked up the news, including The Stranger (the Thursday post was taken down Friday and Stranger editor Steven Hsieh said the item was going to be rewritten and reposted), and it was the topic of hot conversation on Seattle’s Reddit page, where a couple commenters questioned the veracity of the claim. Seattle does indeed have a very high rate of reported property crime, at 5,488 per 100,000 population. It is more than twice as high as New York or Los Angeles, both of which have extremely low rates. But is Seattle No. 1? Only if by “major” U.S. cities you mean the top 20. Because even if you look at the 25 largest cities, Seattle drops back to No. 2, after Memphis. In my column, when I refer to major U.S. cities, I typically look at the 50 largest in population — Seattle drops down to sixth place by that measure. I choose to look at the top 50 to capture a broader range of cities. Who wouldn’t consider Washington, D.C., or Boston a major U.S. city? Neither rank in the top 20. However you want to define a major U.S. city, it’s important to be clear about what you mean. I spoke with Lindsay about his blog post, and he acknowledged that he had only compared Seattle with the other 20 largest U.S. cities. But he agreed that he could have better defined his parameters, and said he would update his blog post to clarify that he was ranking Seattle only among the 20 largest cities. Seattle, incidentally, wouldn’t have counted as a major U.S. city by Lindsay’s definition until 2014, when our recent growth spurt propelled us back into the top 20 for the first time since 1960. Seattle currently ranks as the 18th biggest city. Another thing to keep in mind is that FBI data tracks only reported crimes, of course, and sometimes people don’t bother reporting property crimes. We can’t know the actual property crime rate for any place, only the reported rate. 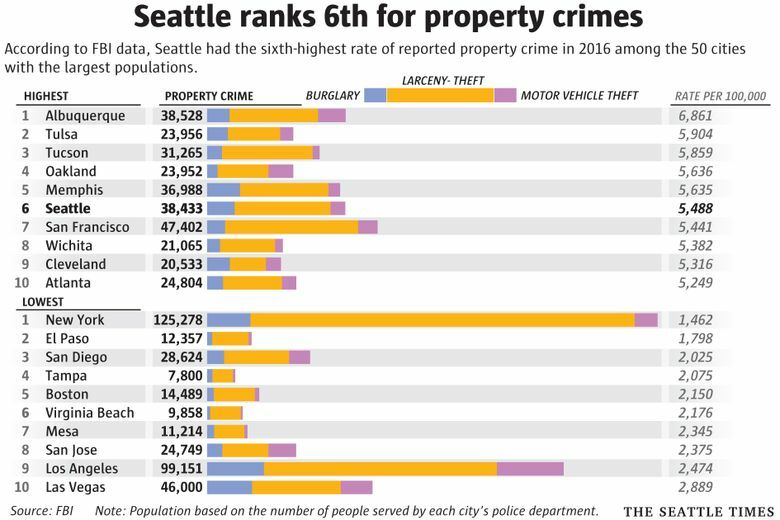 In the FBI data, Seattle doesn’t stand out for any one type of property crime, but ranks fairly high across the board. Among the 50 largest cities, we’re eighth for burglary, seventh for larceny theft and 19th for motor-vehicle theft. One last point: While most people wouldn’t call Spokane or Tacoma major U.S. cities, both had a higher rate of property crime than Seattle in 2016. Spokane reported 7,688 per 100,000, and Tacoma 6,550 per 100,000.